Wearing the same mask design for 10 years isn’t easy in today’s NHL. Most goalies switch their mask art each year with some even switching in-season. That’s what helped make Ryan Miller’s Buffalo mask so iconic and what will make getting used to his new Blues mask so difficult. A legion of Sabres fans spent their formative years with Miller working his way up from Rochester to the face of the franchise is short order. Along for the ride was his red and black era Buffalo inspired mask that was painted by his longtime mask artist, Ray Bishop. The only thing that changed over the years were minor alterations or additions that was finally retired in this form. Miller’s new St. Louis mask is different. Really different. It draws from Curtis Joseph’s old trumpets mask which would up serving as motivation for the Blues organization to include trumpets in their logo. So the pedigree was strong. I don’t think the overall look of the mask translates as well as Joseph’s did, however. It would seem as if Miller wanted the guitars to mimic the trumpets on Jospeh’s mask and the backstory for each is pretty cool. I’m just not a huge fan of the way they look on the mask. The angle winds up leaving a lot of open space on the forehead where the Blue Note sits. I like putting the logo on the forehead and when Miller’s head is down that will combine with the arches on either side nicely. The guitars just aren’t working for me. The chin looks incredible. IN. Credible. And I’m also partial to the way the music notes are laid out on the sides. In the end this falls somewhere in the middle of the spectrum in terms of past Miller masks. 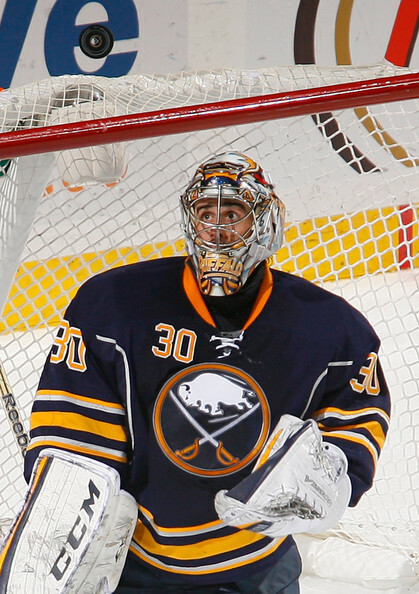 As someone who watched him for so long in Buffalo, I won’t be able to look past the Buffalo head mask he’s worn for so long. 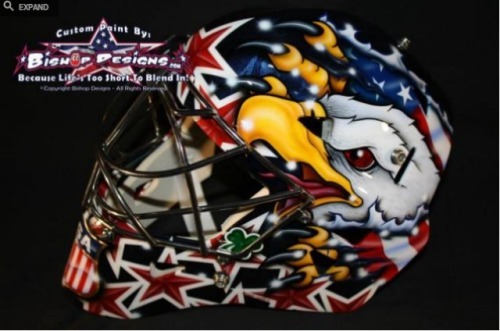 It would be like Brodeur changing his mask or Ed Belfour wearing something other than an eagle, so forgive me for not doing backflips over this particular mask. It’s certainly behind each of his stunning Olympic masks, and probably falls close to the mask he wore for the Winter Classic – a mask which was actually pretty cool when the toque was removed. The Blues mask also ranks well ahead of the two redesigns that never happened to take off. One of which was particularly terrible. I’m looking forward to more Blues, masks however as I think Miller and Bishop can come up with something truly awesome for next year and beyond.